Reunite Holly with her Daughter! We first met Holly in A Christmas Tale. Now she's back in Holly 2: Magic Land! When Holly's young daughter disappears, an elf materializes and tells her she must visit the land of magic to retrieve her child. As you search for Holly's daughter, you'll look for more than 3,500 items, solve a variety of seek-and-find challenges and play several thrilling mini-games. Along the way, you'll meet a cast of enchanting characters and enjoy dozens of charming hand drawn scenes! 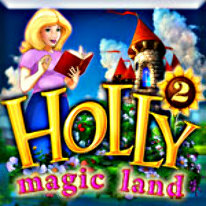 Reunite Holly with her daughter in Holly 2 Magic Land today!